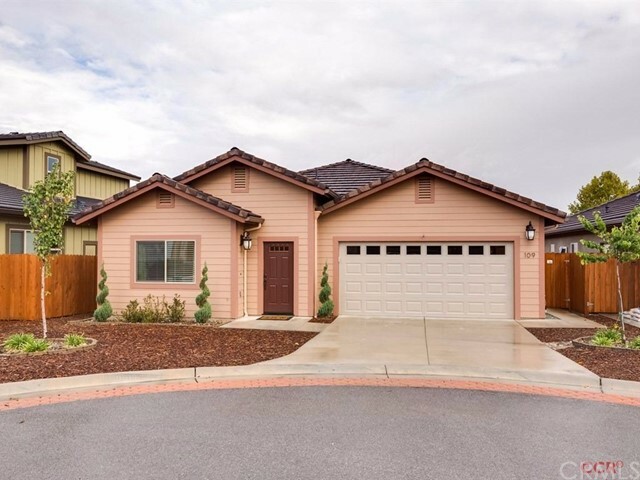 Lovely immaculate Templeton home located in the desirable Creekside Ranch development. This newly built home is located on a small cul-de-sac and offers 3 spacious bedrooms and 2 full bathrooms with 20-inch ceramic tile floors throughout, a fireplace in the living room, ceiling fans in all bedrooms, expansive cathedral ceilings, and an open living, dining, and kitchen to give the home a spacious and welcoming feel. The exterior of the home is as immaculate as the interior and offers epoxy floors, soft water system, and low maintenance front yard with drip irrigation. The backyard offers a paver stone patio, dwarf fruit trees, side dog run, and water misters for those warm days. All of this is located within walking distance to Historical Downtown Templeton and the highly acclaimed Templeton School District.